You’ve deployed your troops to the farthest reaches of the galaxy in search of the hidden Rebel base. At last, you’re ready to strike. Charge into battle and lead your troops across the battlefields of the Galactic Civil War. Fantasy Flight Games is happy to announce two sets of premium bases for Star Wars™: Legion! Order your own copy of these premium bases at your local retailer or online through our website today! Star Wars: Legion invites you to join thrilling infantry battles of the Star Wars galaxy as the commander of a unique army of troopers, powerful vehicles, and iconic characters like Darth Vader and Luke Skywalker. Each game, you and your opponent must carefully move your troops into position to launch attacks, intercept crucial transmissions, recover supplies, or accomplish any number of other objectives. Soon, you’ll be able to further customize the aesthetics of your army by placing your troops on premium plastic bases. Whether you prefer to command legions of Stormtroopers in the name of the Empire or lead elite Rebel strike teams, the premium bases included in these packs upgrade the look of your army and invite you to further immerse yourself in your Star Wars: Legion battles. Each pack of Premium Trooper Bases contains 32 premium 27-mm round bases, enough to upgrade eight standard squads of four trooper miniatures like the Rebel Troopers, Stormtroopers, or Fleet Troopers. The bases contained in the pack include four copies of eight unique sculpts, carefully designed to look like environments at home in the Star Wars galaxy, while their neutral gray tone of plastic gives you the opportunity to paint and customize your bases to fit your army's style. Meanwhile, the Premium Large Bases pack helps you update your army’s vehicles by covering all three sizes of notched bases. Each of these packs contains eight premium notched bases, enough to upgrade two AT-ST or T-47 Airspeeder units, two AT-RTs, and four 74-Z Speeder Bikes. In addition to allowing easy movement of your units, each of these premium bases features its own texture, announcing the uniqueness of your army. Every game of Star Wars: Legion promises to be an intense, strategic duel as you and your opponent battle for objectives. 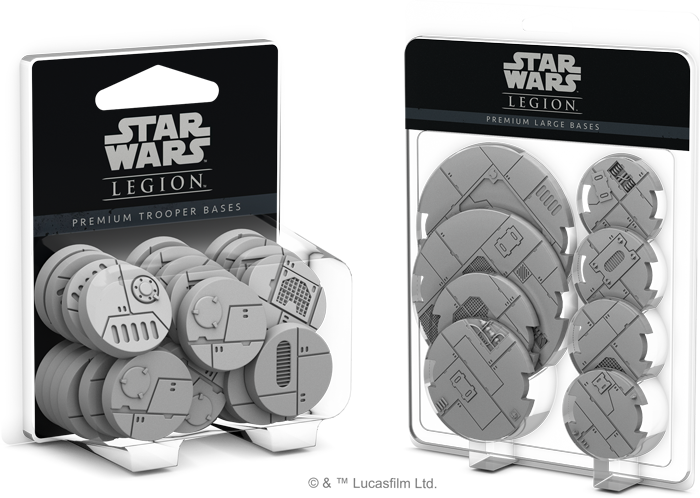 Bring your troops to the fight with style with Premium Trooper Bases and Premium Large Bases for Star Wars: Legion, and look for these packs to release late in the third quarter of 2018! You can pre-order Premium Trooper Bases (SWL28) and Premium Large Bases (SWL29) at your local retailer or online though our website today!